1. I don't want to go back to work tomorrow. 2. Had a great afternon yesterday which ended with fish and chips and a good natter, and great company - three of my fav things. 3. I'm thilled with the choice of the next Doctor Who. 5. I have a nagging feeling I spent it..
6. I want to buy lots of cheap Dr Who DVDs from Play before their Sale ends, but better not until a) after my Birthday (just in case)and b) until I get paid next. 7. I'm really really REALLY thrilled with the Choice of Matt Smith to play the role of the next Doctor. After watching the interview with the young actor on Dr Who Confidential and having now worked out what I'd seen him in before, namely Party Animals, in which he played a political researcher to a Government Minister (In which role he was, brilliant compelling and immensely likeable) I am convinced he's going to be absolutely fantastic in the role. In an odd way it reminds me of how I first became aware of David Tenant as a young actor who starred alongside another brilliant actor Ken Stott in a Drama about Hospital Radio. DTs performance in that drama in the early 1990's seared itself into my mind in the same way that Matt Smiths fallible but likable character in Party Animals did. He's going to be great...and with hopefully darker scarier stories by Steven Moffat I hope the series will ascend to even higher levels..... Great stuff. I was sad to see Chris Eccleston go, I'll be sad to see David Tennant go, I'm really pleased with the choice of new Doctor....his age I think will be irrelevant. And for any doubters, just remember the fuss every one made when Daniel Craig was cast as James Bond......Daniel turned in what I think was arguably the best Bond film EVER in the shape of Casino Royale! ...Paul was very Grumpy at the prospect of having to return to work. He's decided not to visit the Old-Folk's-Home for dinner this evening and is instead spending his evening salvaging the last vestages of Christmas curled up in the living room, watching the Nutcracker, Lark Rise to Candleford and readig and enjoying the candles and tree and his stash of Fab prezzies. Ray Mears and the Partisans of Novogrudok, Belarus. 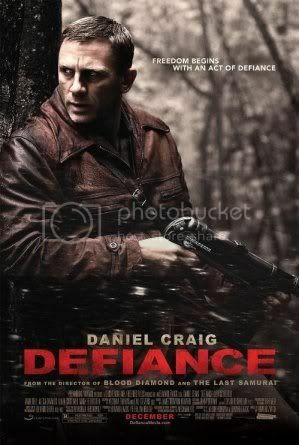 I am thrilled to learn that there is a film being released on 16 January (starring Daniel Craig) called Defiance, which is based on the true story of Partisans of Novogrudok, Belarus, who hid in the forests and swamps of Belarus and fought a very successful three year long guerilla war against the occupying Nazi forces during WWII. The movie will, I am sure, be an all action thrilling visual feast which will further highlight the talents of Mr Caig. However, for a truly moving account of their struggle I would recommend you watch episode 1 of the Second season of Ray Mears' Extreme Survival, which I first saw almost a decade ago. In the documentary about the Partisans, Ray explains how Bushcraft enabled the fighters to survive and stay hidden from the Germans , and avoid capture until the end of the war. The documentary features surviving partisans who recount their story first hand. It's an incredibly moving documentary, recounting the struggle of a group whom history has largely ignored. The final scenes in which they thank Ray for telling their story reduces Ray to tears and I'm not ashamed to say me too. I shall book my ticket the moment they become available. Christmas was Pretty this year ! Christmas this year was very pretty ! With my new laptop PC, I am now able to download and edit my digital photos....such a novelty !